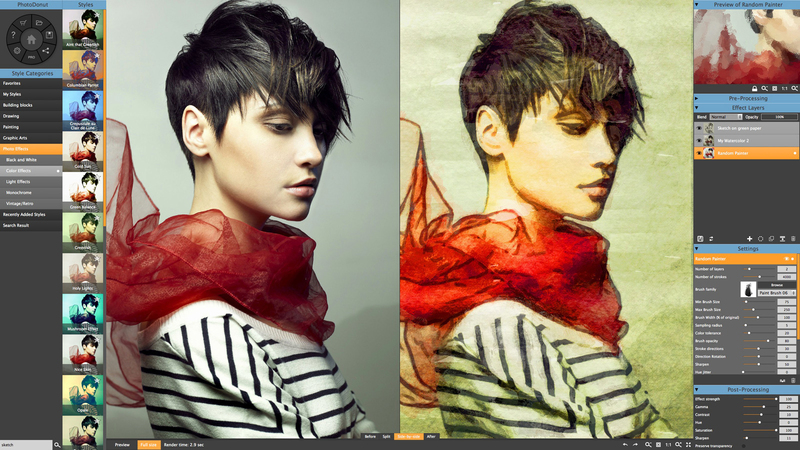 Enjoy hundreds of built-in styles that let you transform photos into art! PhotoDonut Creative Edition was available as a giveaway on December 22, 2016! Enjoy hundreds of built-in styles that let you transform photos into art, including drawing, painting, illustration, and photo effects. With Creative subscription, you can even create your own custom styles using the node-based Style Editor, or enjoy features such as Freehand Painting with the ability to “grab a brush” and transform the images with more control. Find an effect you like? Apply it to multiple photos using Batch Processing, and make “Donuted” videos if desired! Best of all, you can use PhotoDonut Creative as a standalone program or as a plug-in, whatever suits your needs the best! How would you improve PhotoDonut Creative Edition? Want more from PhotoDonut? Get more! Expand your options and upgrade to a Premium subscription to get an access to the ever-expanding extra content in the Styleshop! 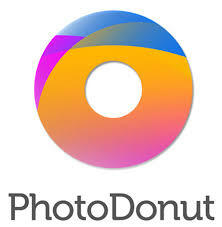 Get the PhotoDonut Premium with 70% off! There will be a Steam key giveaway on Friday 23rd Dec (tomorrow) , which I think is well worth getting. The usual cost of this giveaway is almost £15/$20, I think it's also a global giveaway (though cannot confirm at this time); hopefully it will be so that everyone will be be able to get a key. After checkout, please give it 10-15 minutes to propagate your license info to your geographic area. Your login and password are your billing email and serial number, respectively. Your account will be already created, you just have to log in. Please do not register a new account, your Creative license is tied to your above-mentioned credentials. After checkout, please give it 10-15 minutes to propagate your license info to your geographic area. Your login and password are your billing email and serial number, respectively. Your account will be already created, you just have to log in. Please do not register a new account, your Creative license is tied to your above-mentioned credentials. Eric, this offer has expired. Can you explain what happens at the end of the sub after the year is over? Does the software stops working completely, or reverts to the free version? 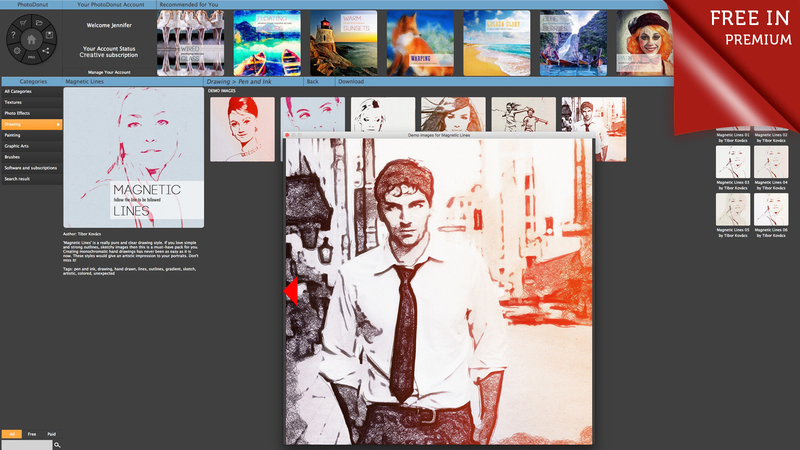 Do you loose access to what ever you have downloaded from the style shop, extra artistic packs etc? or you get to keep what you have already downloaded and just you loose access to getting anything additional? Just not sure how this works. The license shown from the eseller at the start of the purchase states that the software will stop functioning all together. @ Bela Biro Can you explain what happens at the end of the sub after the year is over? Does the software stops working completely, or reverts to the free version? 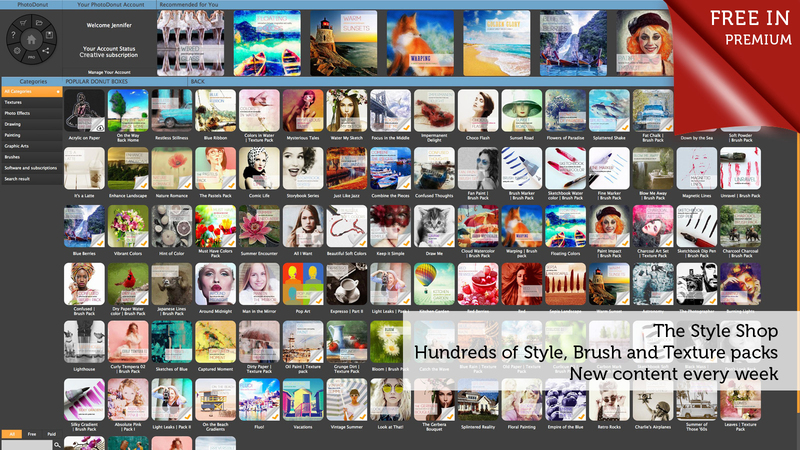 Do you loose access to what ever you have downloaded from the style shop, extra artistic packs etc? or you get to keep what you have already downloaded and just you loose access to getting anything additional? Just not sure how this works. The license shown from the eseller at the start of the purchase states that the software will stop functioning all together. Thanks. Couldn't open the program. It wanted my hardware to upgrade the graphic driver! Uninstalled. Great compliments to the Giveaway Team, yes indeed, today's gift is superb. I guess for a lot of visitors to this site the application will be too demanding on the machinery, but those who are lucky enough to meet the specifications it promises plenty of enjoyment. Some user refer to this software as lendware which, I may just point, it is not. This software, as a lot of other software is gets paid by annual subscription. In other words, we all get one yr for free. Standalone software plus plugin to Photoshop as was paid for in the old times would probably rule the software out for most of us. Dear Bela Biro, thx for your generous gift. Best wishes for you and your team for Christmas and for 2017 a successful and prosperous New Year. My Season's Greetings to all visitors and staff here are simple ,but from the bottom of my heart. Peace and Good Health to All of You. Thanks Sigrid and Happy Holidays! i,m having trouble getting it to run on windows 3.1, i have 4 mb of ram and a 25mgz what;s wrong? how many hours (or days?) does it take to get a new password ?????????????? walt, if you request a new password then you are already in trouble, because it will never work with your Creative account, that is registered to your serial number. Password changes are for people who don't have live subscriptions. If you got the Creative license offered here, you have. Log out of whatever account you invented for yourself, and log in with your billing email / serial number as login / password. walt, if you request a new password then you are already in trouble, because it will never work with your Creative account, that is registered to your serial number. Password changes are for people who don't have live subscriptions. If you got the Creative license offered here, you have. Log out of whatever account you invented for yourself, and log in with your billing email / serial number as login / password. GAH! In all the years I've been coming here, this is the first time I've not been able to register a program, and I don't know what else to try. I'm signed out of the website account, and I've tried using copy/paste with the serial # as a password,k and my email address to login - and get a notice that they're "mismatched" (I'm trying to register via the "Register as StyleShop user" screen. Even tried uninstalling and reinstalling - any help? hamstergirl4444, Okay, now it's even worse - I can't even uninstall this thing. It's not listed on the Control Panel, and when I go to the folder where the app is installed, and click on "Uninstall PhotoDonut", I get a "not here, want to browse for it" msg. *sigh*...why do I do this to myself, lol. I used Iobit Uninstaller. The program was in its list and I uninstalled it easily. hamstergirl4444, I used Iobit Uninstaller. The program was in its list and I uninstalled it easily. Could you please tell me where I could download it for MacOS User?. Thanks. Program is ok but you have to wait 15 minutes to register, it is the first time I come across a program that makes you wait that long for registration. If you have 15 spare minutes of your life for a 1 year license photo program ok. Program is ok but you have to wait 15 minutes to register, it is the first time I come across a program that makes you wait that long for registration. If you have 15 spare minutes of your life for a 1 year license photo program ok.
@BelaBIro: Still here? Are you able to answer my question? Much thanks! Jack Kerr, looks like this comment section has a few glitches ... Your comments are timestamped with "6 hours ago" and they just arrived here. One year, and rentalware. No, thank you. Paint.NET is always free and has many more features. and to many others, whose names escape my memory at the moment. Paint.Net has a plethora of effects and terrific free plugins, developed by the members of their team. Bela Biro, Wroooooong. Paint.Net has a plethora of effects and terrific free plugins, developed by the members of their team. No rentalware. Do you have a "Comparison" web page between PhotoDonut for free Vs. Pro Vs. Creative? Not really because Creative is not for sale normally, but it is simple. A couple more details about my machine: Intel Quad-core i7-4790 3.60 Ghz RAM: 16 Gb 64-bit Thanks for looking into this! And, YES, I have one of the latest 64-bit machine. Unless I receive any sort of feedback from you, I will simply UNDELETE the whole thing.... and forget the whole thing! I decided to give it a try, downloaded and installed the fairly large file +260Mb, and went to the registration process. I (tried) to activate it, then on the last screen got the following error message: PhotoDonut Activation The supplied serial number is activated, but cannot be validated on this machine. Error code: 0 And, YES, I have one of the latest 64-bit machine. Unless I receive any sort of feedback from you, I will simply UNDELETE the whole thing.... and forget the whole thing! Jack, that has nothing to do with your machine. Just follow the instructions. You are not supposed to create an ad-hoc account and the enter your serial. Your account is already created for you and it can be entered by using your email and serial number as login/password. So just log out of whatever account you invented and log in with the proper credentials that are tied to your Creative account. What is the process for installing this as a plug-in? beans, go to Settings (cogwheel icon), select Plugin Installer, select your Photoshop installation, then click Install plugin into the selected application. noniboy, if you have another video card in your machine, try to launch the program with that. A user successfully did it, scroll down for his comment. If it is the only chip in your machine and Intel does not have a new driver for that, then PhotoDonut is unfortunately not compatible with your machine. noniboy, if you have another video card in your machine, try to launch the program with that. A user successfully did it, scroll down for his comment. If it is the only chip in your machine and Intel does not have a new driver for that, then PhotoDonut is unfortunately not compatible with your machine. +Bela Biro - I take it that "PhotoDonut Creative Edition" is the name of the version specific to today's GOTD offering, as I do not find the same on your website. Further, I take it that its features are the same as the "Premium" version mentioned on your website and priced at $59.00 for an annual subscription to the StyleShop but WITHOUT Pro features. When I look to "Get the PhotoDonut Premium with 70% off! ", I am taken to your order page that quotes $59.00 for an annual subscription to your Premium version. That is the regular, full price, no? And, since today's giveaway appears to be a rebranded "Premium" version anyway, where can I find the Pro version at 70% off that I "think" you intended to offer? +Bela Biro - I take it that "PhotoDonut Creative Edition" is the name of the version specific to today's GOTD offering, as I do not find the same on your website. Further, I take it that its features are the same as the "Premium" version mentioned on your website and priced at $59.00 for an annual subscription to the StyleShop but WITHOUT Pro features. When I look to "Get the PhotoDonut Premium with 70% off! ", I am taken to your order page that quotes $59.00 for an annual subscription to your Premium version. That is the regular, full price, no? And, since today's giveaway appears to be a rebranded "Premium" version anyway, where can I find the Pro version at 70% off that I "think" you intended to offer? Premium is for free shop access, Creative is for advanced program features. They just happen to have the same price. The Pro subscription has both: advanced features + free shop access. 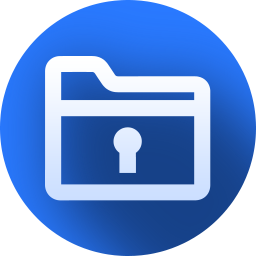 The Creative subscription is a promo license type, normally not sold as an in-app purchase. We offer the Premium subscription at a discounted price today because it complements Creative nicely. The two together will give you the same advantages as a Pro subscription! The Premium cart link contains a pre-configured coupon, as displayed in the price column ($59 - $41.30). You will see the final, discounted price at checkout (when you can still decide to cancel your purchase). JMJ, Premium is for free shop access, Creative is for advanced program features. They just happen to have the same price. The Pro subscription has both: advanced features + free shop access. The Creative subscription is a promo license type, normally not sold as an in-app purchase. We offer the Premium subscription at a discounted price today because it complements Creative nicely. The two together will give you the same advantages as a Pro subscription! The Premium cart link contains a pre-configured coupon, as displayed in the price column ($59 - $41.30). You will see the final, discounted price at checkout (when you can still decide to cancel your purchase). I got the serial number and all else seemed to work as expected. Yet when I attempt to login using the email address as my username and the serial number as the password, as per the readme file instructions, I get the error message that one or the other is invalid. Please help me! Paul, this was probably just a delay in your license registration. It should work now. After reading the comments, I was able to install to a different directory by creating one (PhotoDonut) under "Program Files." Operation seems to be fine. It's a bad idea to have a program install to AppData. That is typically where a lot of viruses like to operate, especially the nasty Locky variants. I would definitely change this behavior on the next version of the software. I'm still waiting for my registration to become active, but I have to say I'm disappointed that this is LendWare. I know that this is A Thing in software now, that Microsoft and Adobe have adopted this model, but I personally prefer "Install it once and it's yours forever" software. After reading the comments, I was able to install to a different directory by creating one (PhotoDonut) under "Program Files." Operation seems to be fine. It's a bad idea to have a program install to AppData. That is typically where a lot of viruses like to operate, especially the nasty Locky variants. I would definitely change this behavior on the next version of the software. I'm still waiting for my registration to become active, but I have to say I'm disappointed that this is LendWare. I know that this is A Thing in software now, that Microsoft and Adobe have adopted this model, but I personally prefer "Install it once and it's yours forever" software. When it is clear that a specific program needs an ongoing effort from the maker, I would be willing to pay every year. An Antivirus programme for example needs daily attention. But a programme like today only needs bug fixes. So there is no reason to pay on a yearly basis. This maker should take a look how a firm like Softmaker operates. They have excellent software and their bug fixes are free. Every two to three years they will offer a newer version. You are free to upgrade for as reasonable price, or stick with the older version. They even give away the older version around Christmas. For this programme I am not willing to pay $59 yearly. Not even if the first year is free. Re "This GOTD installs into ....\AppData\Local\PhotoDonut folder, why? And you can't change that. " I could. I installed it on a virtual W7 64 and saved the ....\AppData\Local\PhotoDonut folder to my desktop. There it runs fine, wherever I place that folder. This is not a giveaway, but a lendaway. You can only use it for one year. Then it will stop functioning/ When it is clear that a specific program needs an ongoing effort from the maker, I would be willing to pay every year. An Antivirus programme for example needs daily attention. But a programme like today only needs bug fixes. So there is no reason to pay on a yearly basis. This maker should take a look how a firm like Softmaker operates. They have excellent software and their bug fixes are free. Every two to three years they will offer a newer version. You are free to upgrade for as reasonable price, or stick with the older version. They even give away the older version around Christmas. For this programme I am not willing to pay $59 yearly. Not even if the first year is free. Re "This GOTD installs into ....\AppData\Local\PhotoDonut folder, why? And you can't change that. " I could. I installed it on a virtual W7 64 and saved the ....\AppData\Local\PhotoDonut folder to my desktop. There it runs fine, wherever I place that folder. BTW, why do you think that a program like this does not require continuous development? The users would get bored very fast without new filters and artistic styles released regularly. If it makes you so frustrated, I can only suggest that in the next 12 months you don't use PhotoDonut with Pro features for free :) BTW, why do you think that a program like this does not require continuous development? The users would get bored very fast without new filters and artistic styles released regularly. I can't get it to activate on my machine. I get code 0. As described in the readme file (and also on the login screen of PhotoDonut), please LOG IN with your billing email and serial number as login/password. Your account already exists, you just have to log in. If you created an ad-hoc account for yourself, please log-out from that. The above-mentioned email+serial makes your account a valid Creative license. Larry, As described in the readme file (and also on the login screen of PhotoDonut), please LOG IN with your billing email and serial number as login/password. Your account already exists, you just have to log in. If you created an ad-hoc account for yourself, please log-out from that. The above-mentioned email+serial makes your account a valid Creative license. phil, the cart page DOES NOT ask for credit card details, unless you messed up something, e.g. removed the coupon or added another product to the cart. Your order total must be $0.0, so no need to pay anything. Or maybe you clicked the PREMIUM button, wich is not in giveaway, the CREATIVE license is. Installation was ok, but failed to load with failed to initialize OpenGL v 3.2 context error. Installation was ok, but failed to load with failed to initialize OpenGL v 3.2 context <a href="http://screencast.com/t/RHeTpGqx1lJ" title="error" rel=" noreferrer" target="_blank">error</a>. You should try to update your video driver. If it still won't work, then, unfortunately, PhotoDonut is not compatible with your video card. Bela Biro, yeah, but i have the latest Intel HD Graphics 3000 version. I found that right click run with NVIDIA processor works. Thanks! Bela Biro, yeah, but i have the latest Intel HD Graphics 3000 version. I found that right click run with NVIDIA processor works. Thanks! for a revue see e.g. This GOTD installs into ....\AppData\Local\PhotoDonut folder, why? After installation it wont run, why? because it's only for 64B. Sooooo why didn't it check the OS before installation and alerted? This GOTD installs into ....\AppData\Local\PhotoDonut folder, why? And you can't change that. After installation it wont run, why? because it's only for 64B. Sooooo why didn't it check the OS before installation and alerted? adif, "64 bit only" was clearly mentioned in the upper right corner of this page, under System Requirements. we would kindly ask you to read the provided program description! This includes system requirements (to make sure the program really runs on your computer), the whole program description (to see the last line that always tells if there is a 1 year or some other license kind) and follow the steps provided in readme file (it is placed there for you and prepared by us manually every time). Following these simple rules would eliminate a huge amount of the problems, misunderstanding and complaints. You'll have the idea what you install and how it is supposed to be registered right and won't find any unpleasant surprise at the end! You'll be ready to provide the developer and others with your ideas as to the program functions and usefulness as your experience won't be spoiled by other things. Let's enjoy using this site together and have the great time getting ready for Christmas! Bela Biro, You are surly correct but a clever installation check OS before hand. and part of this GOTD reviews are such comments. adif, thanks, we will check the install builder whether there is such a pre-check-OS option. Honestly, I thought is was something by default. Bela Biro, Re your " I thought is was something by default." Does this mean you never checked your software on a 32 bit machine? Are you not curious? I am. So i will test on several virtual machines. And quite often a giveaway will run on a virtual system that does not fulfill the system requirements. Bela Biro, Re your " I thought is was something by default." Does this mean you never checked your software on a 32 bit machine? Are you not curious? I am. So i will test on several virtual machines. And quite often a giveaway will run on a virtual system that does not fulfill the system requirements. Bela Biro, or even compile the installer as a 64 bit executable IF the installed program is a 64 bit application! That way it cannot even run under a 32 bit operating system! Seems a bit counter intuitive to install a 64 bit program with a 32 bit installer and have to consider an install time check to see if the host OS is 32 bit or 64 bit before proceeding to try and install! Helen, After all these years, finally, a name of a member of the GOTD team! My suggestion re activating products, is simply provide a license/key/serial up-front rather than using wrappers and other means employed. Other giveaway sites do that, or just email the info. And @Bela Biro, I can appreciate some vendors wanting an intervening step to ensure we visit their site. Yet despite very clear install instructions (kudos), Xycod messes things up with a silly, "After checkout, please give it 10-15 minutes to propagate your license..."
Well, it's been ~45 minutes for me, nearing 3am EST. I'm canceling the Login and expect it'll be okay to login much later on the 23rd and have it accept my email and serial?? ?